The hidden truth - We dare you! That is what we here when we tell people about Manuel’s condition and of course we are happy for the coat he has managed (so far) to keep. But there is a lot hidden underneath. I can say that we have decided to increase the Atopica from 200mg every third day to 200mg every second day again as we now actually feel that the we have seen results of that the Atopica makes a difference. We will still try to cut down when we see it fits, but obviously it was a bit too much. One can not relax just because of the coat growing, there are signs even if more subtile to an untrained eye. Have a look, here you can see the irregularity in the coat that tells me something is ongoing. Either a spot “under attack” or a spot that has been under attack (no under-wool left). 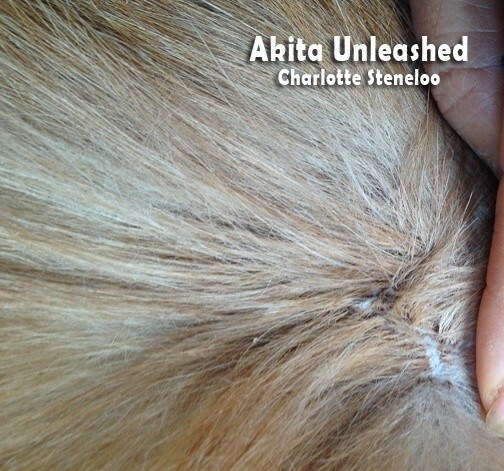 At first the hair seems moist and lies flat, then the sebum shows, and then the inflammation. His neck and head have recovered really well (of course it shows but we are happy for every piece of hair that stays). BUT, I want to show you the areas that have lost the under-wool. It is easier to see when the coat is wet and now you might understand why I need to get him a rain-coat. When it rains it is full access to the skin in this area. Wet, cold water, and dry skin is not the greatest combination. We are right now evaluating available dog-jackets out there. We do have some problems, but we have got some very nice tips on various dog-jackets. 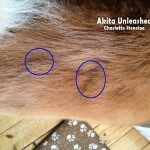 We need to cover the neck (preferably the tail) – which Akita will move? Not likely Manuel. 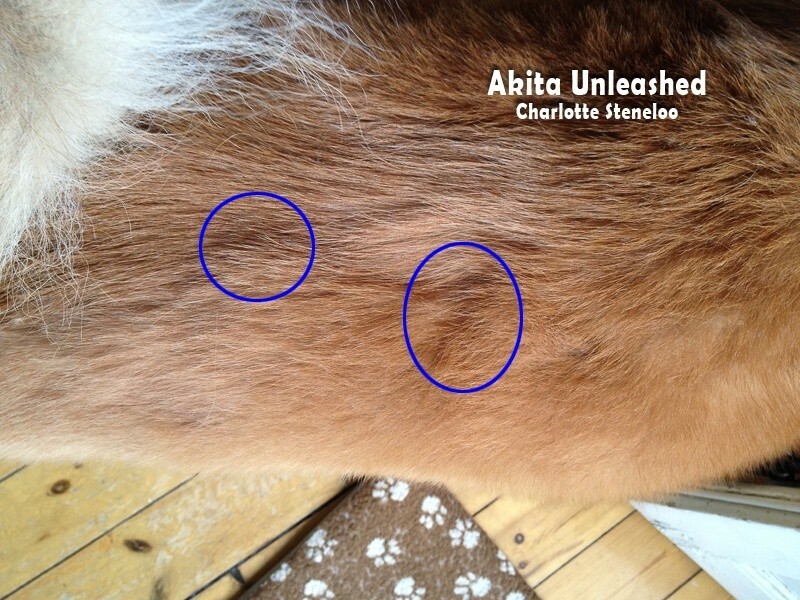 We need a measurement that fits a coarse Akita-neck, in combination with a short body. It would be nice with some padding for those periods when he is “naked” so we can go out in the snow, and even put the harness on top of the dog-jacket – for skiing together – which he loves! It can not be too warm and must be breathable. Maybe we will need two different coats. Of course I love the most expensive ones the best.